First off, I've decided to change my post dates to Sundays so I can't procrastinate and end up drowning in homework on Mondays. 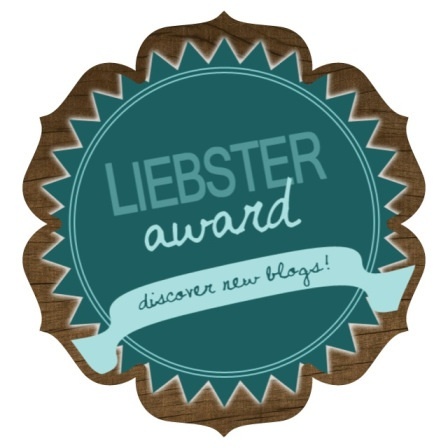 Lola's Little Wonders nominated me for the Liebster Award! You may ask, what in the world is the Liebster Award? It's just another way to make friends in the blogger community. Mainly, you must provide your readers with 11 random facts about yourself and answer 11 questions from the blogger who nominated you. Then in return, you must nominate 11 bloggers that you love and ask them 11 questions! So let's do dis. 1. I went into anaphylactic shock at the beginning of the year, but the doctors can't figure out what I'm allergic to. 2. I'm in an intensive program at school called International Baccalaureate (IB), which means I'm drowning in homework everyday. Yet I still love high school. 3. Autumn is my favourite season since because it's no too hot, nor cold and not too humid nor dry. A plus is that I have an obsession with scarves, boots, sweaters and beanies. 4. I care more about what other people think of me than I'd like to. 5. I have an unhealthy obsession with YouTube. 6. One of my favourite memories was going stargazing on a quiet beach when we were camping and spotting different constellations. I've never had better mosquito bites. 7. I always want to decorate my room, but I don't want to waste money on it, haha. 8. I am legitimately still waiting for my Hogwarts acceptance letter. Actually, my sister just told me on Wednesday that our school has a toilet that has "Flush twice for Hogwarts" written on it and I'm seriously considering. 9. I can't stand people killing anything. I literally make my parents take spiders outside instead of killing them because I see everything as equal beings. That sounded really intense, haha. 10. I didn't say a single word until I turned 2 years old. And then I wouldn't shut up. 11. I don't actually play the games on my phone much, I mostly use my phone for surfing the Internet. 1. Favourite song of the moment? The first two that come to me are Let Her Go by Passenger and Wings by Macklemore, which is funny because I don't listen to the two songs that often. It's just that the songs are so well written that I always have to stop everything I'm doing when the song comes up to just listen and feel. 4. You've got £10 to spend on one beauty product, what do you buy? 6. Favourite high street shop? 7. Do you live by any mottos or mantras? 8. What beauty product can you not live without? Concealer, I have really bad acne problems. 9. What was your first word as a baby? 10. What is your favourite blog to read? 11. What is your best blogging tip to give new bloggers? Blog about whatever comes to your mind and don't try to copy other bloggers. Mainly, be yourself. Cheesy, but true. 1. Favourite artist(s) at the moment? 2. What is the best book you've ever read? 3. What is your autumn essential? 5. Do you have nay weird talents? 6. What is/was your least favourite subject at school? 7. Funniest joke you know? 9. What are you most excited for right now? 10. What is one food you will never be sick of? So that's it! All 44 items done. It took so much longer than I thought it would, but it was definitely super fun finding all these amazing blogs I tagged. Hahaha I am obsessed with YouTube and totally dont play the games on my iphone either ha! !